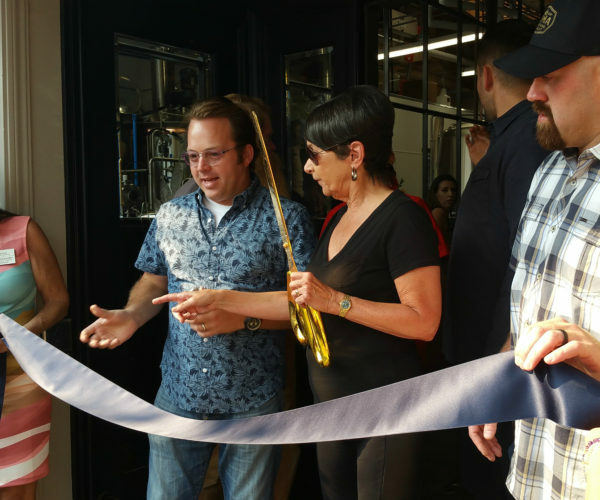 The Loma Brewing Company Grand Opening took place a couple of nights ago and it was both extremely well attended and well received. 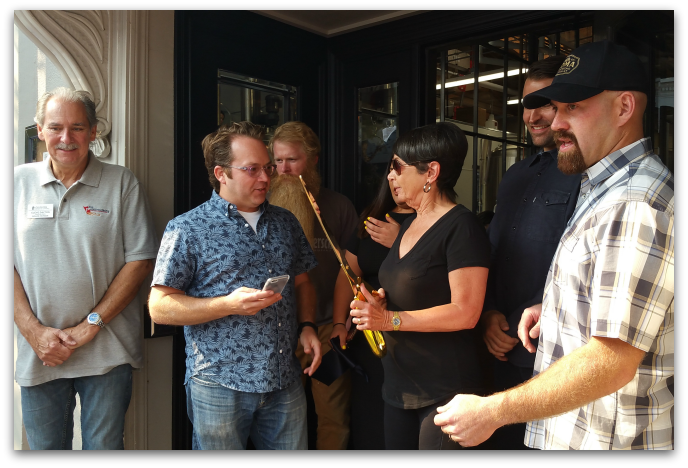 By 4:45pm, a few dozen fans and friends had gathered near the front door of the brewpub, awaiting the ribbon cutting and the chance to enter Loma for the first time. 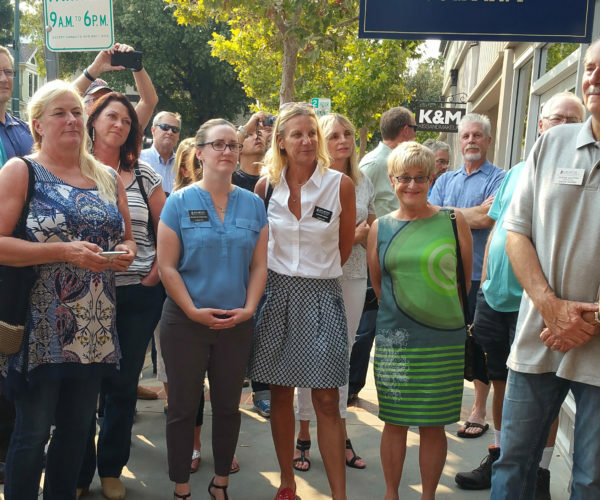 The owners, Scott Youkilis (image left in blue shirt) and Kevin Youkilis (right side of photo), each held one end of the ribbon, and Barbara Spector, mayor of Los Gatos, cut it with a large, gold, ceremonial pair of scissors. Also shown is the talented BrewMeister, Warren Billups (just behind Scott). Apologies that I do not know the names of the others in this photo. 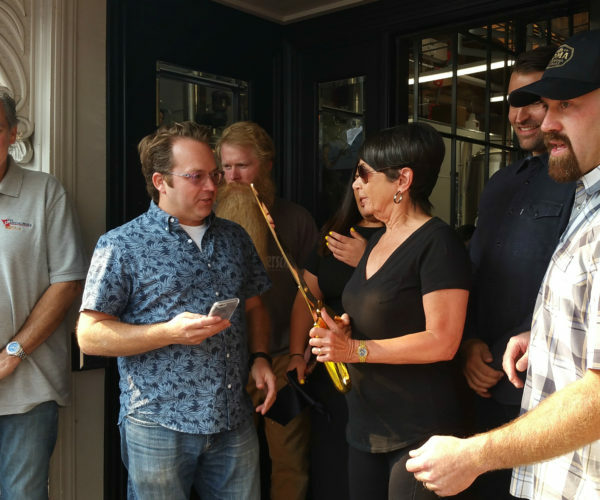 Inside, Loma Brewing Company Grand Opening was an immediate mob scene! Someone at the reservation podium was asking who had reservations (had I known that was possible, we’d have reserved, but that wasn’t the case so we made a beeline for the bar). I was extremely impressed that the staff handled the hyper rush with speed, skill, and calm. (This wasn’t just any rush: this was the entire place filling up instantaneously!) The staff was amazing. Unfortunately, we couldn’t stay long enough for a meal, or for me to finish my flight completely, as we had another grand opening to attend at the same time, so after an hour we needed to get going. We did peruse the menu, which was impressive and offered quite a few temptations. Many patrons were eating around us, and the food looked wonderful. Very few breweries around here seem to qualify as a Gastropub, so I’m anxious to try the food next time. 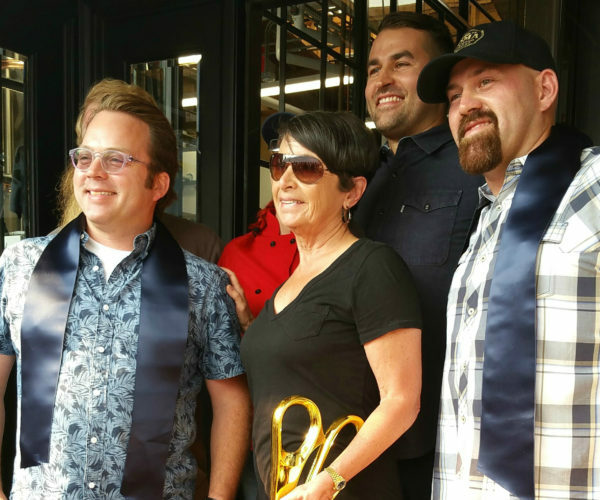 Some Los Gatans may have been expecting a revival of the former brewery on this site, the Los Gatos Brewing Company. That would be a mistake, despite the same physical address. This is a whole new venture, with new owners, new beer, new food, new equipment, new recipes, new talent, new everything. Go to it with an open mind, not expecting to see or taste or experience what was there before. 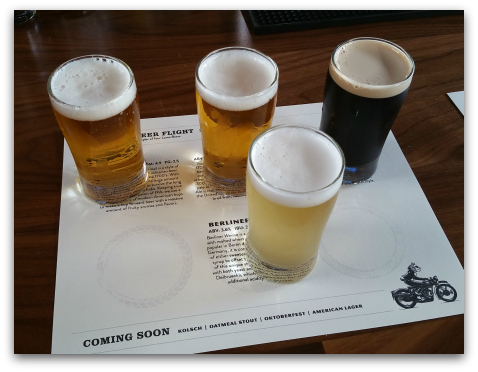 Loma Brewing Company has been set up with the contemporary and low key warehouse style of decor, which is so popular today. 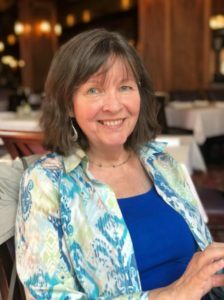 (As with the new Super Duper Burgers and also the new Mooya Burgers, both in Los Gatos, or with the many public markets springing up around the state.) I did not notice an acoustics problem, which seems to happen with the warehouse style, so kudos to their designer for addressing that so well. We sat at the bar and it was comfortable in every way. And I appreciated the hooks for purses there, too. 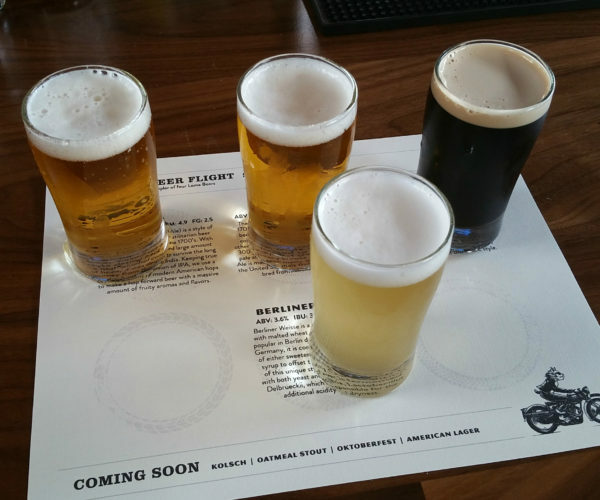 If you love beer, you will love this place. Right now, it’s open 5pm to 10pm, but starting sometime in September will also be open for lunch. Find them online at http://www.lomabrew.com/ and also on Facebook and Twitter. Join us for our grand opening celebration on Thursday, August 18, starting with a ribbon cutting at 4:45 p.m., followed by our official opening at 5:00 p.m.
We will be open for dinner from 5:00 – 9:00 p.m. daily. In September we will extend our hours and begin serving lunch as well as weekday happy hour, in addition to dinner nightly. 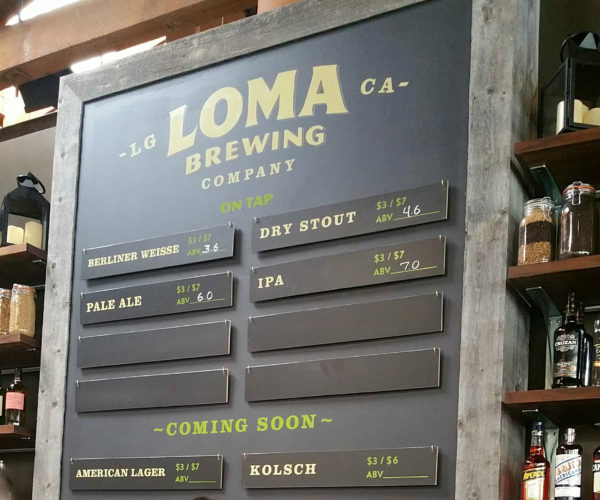 Stay in the know by signing up for our newsletter and following us on social media for the latest Loma updates – @lomabrew. We look forward to serving you – cheers! 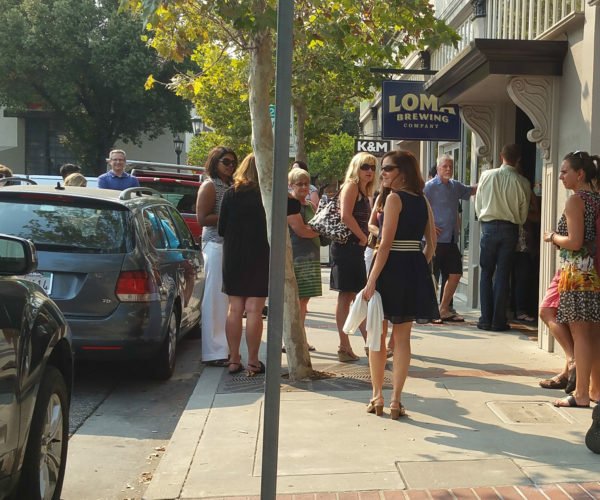 I plan to stop by for the Loma Brewing Company Grand Opening and wish them well – hope to see you there!